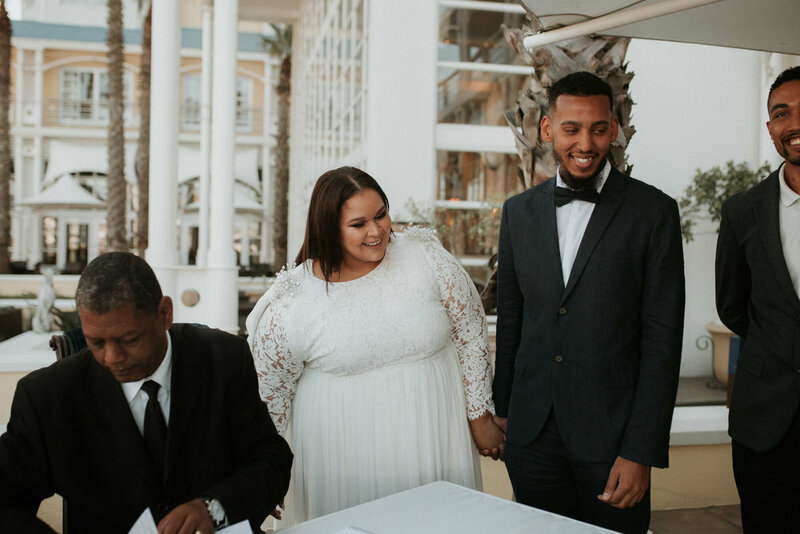 Dalreece and Jarreth first met on Tinder and after talking for a week they took the plunge and met IRL. 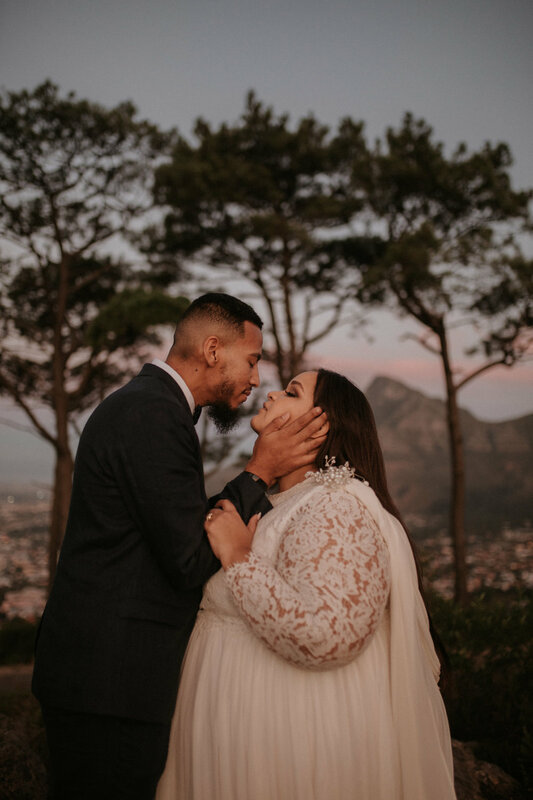 For their first date, they went to a national park near their home in Cape Town, South Africa to see some elephants. 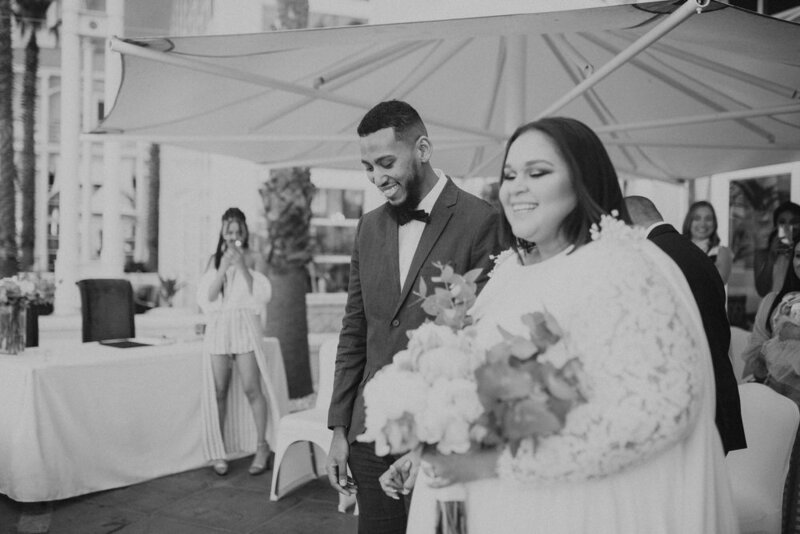 The conversation was fun, the laughter was easy, and the attraction was heavy. 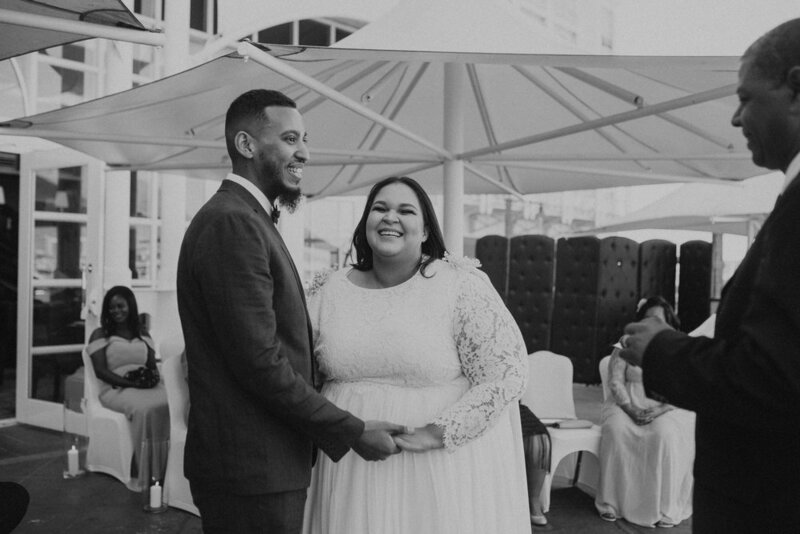 They both knew right away, this was love. 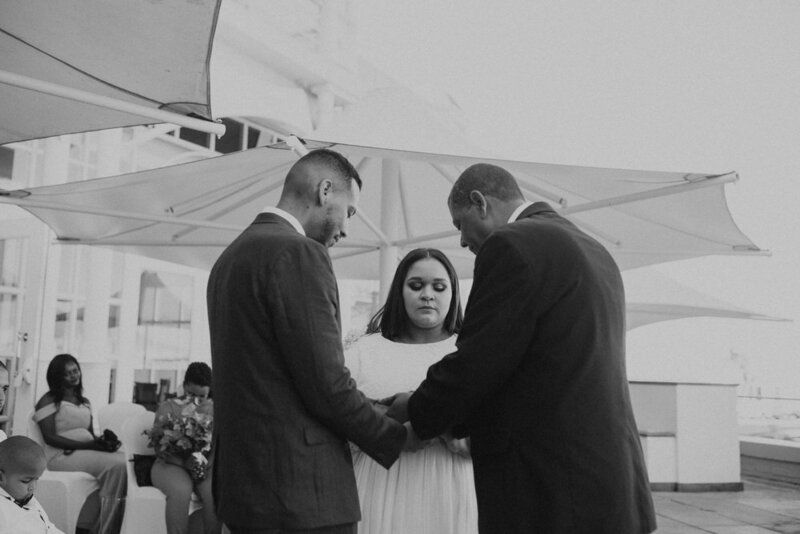 When Jarreth proposed, it was simple, sweet, and personal just like everything this couple does. 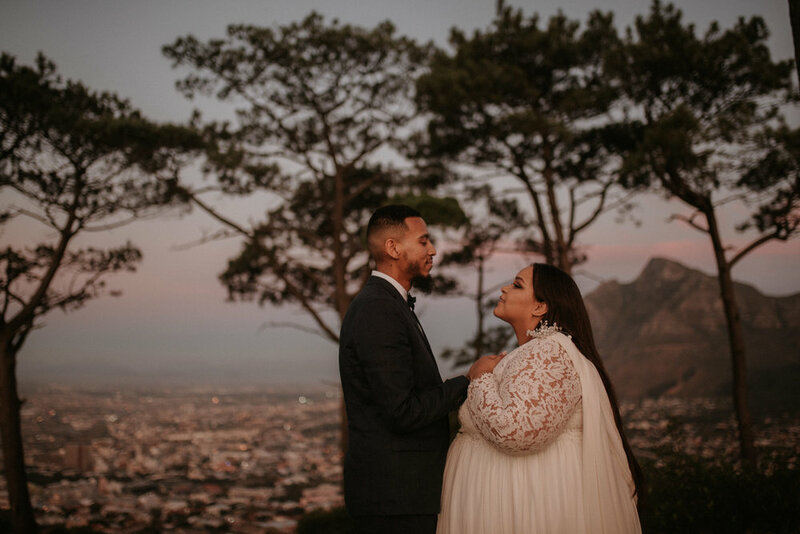 They hiked up the well-known Cape Town landmark Signal Hill, just the two of them, to watch the sunrise. 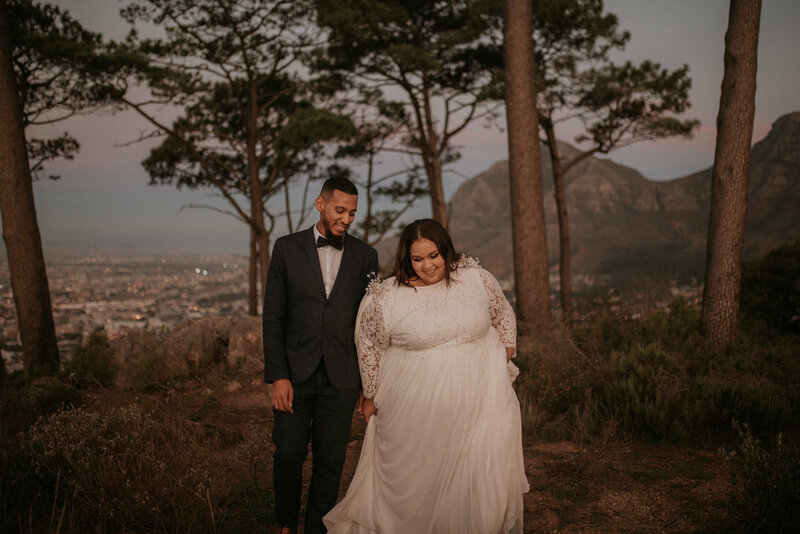 When they got to it’s flat top and took in the gorgeous panoramic views with the sun just starting to kiss the city, Jarreth asked Dalreece to be his wife. 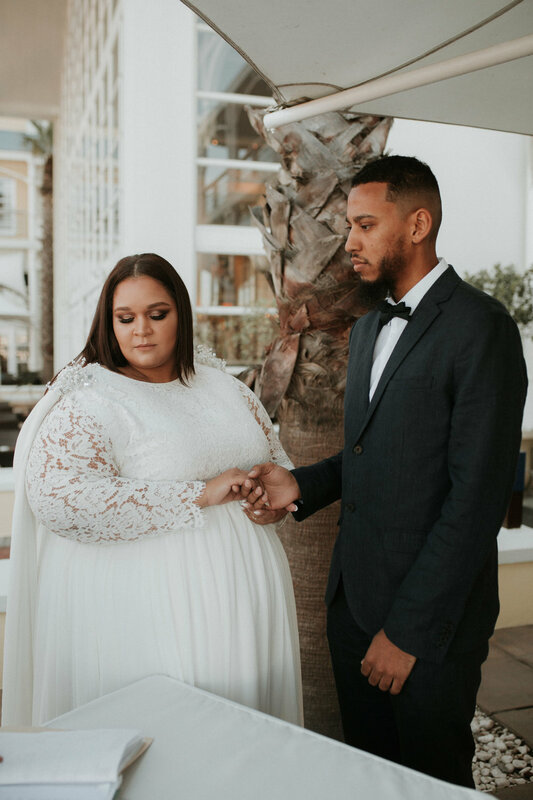 “It was simple, but perfect,” said Dalreece. 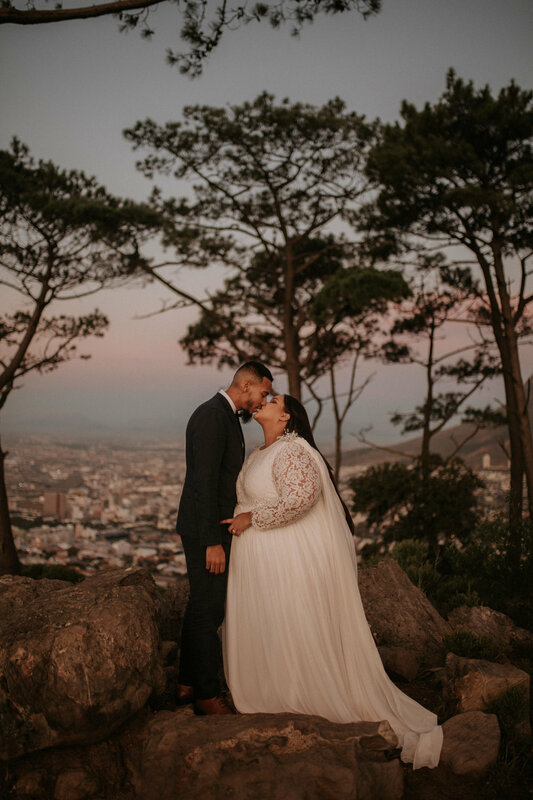 You can find the bride on Instagram @dalreecerankin_andreas and the groom @jarrethandreas. 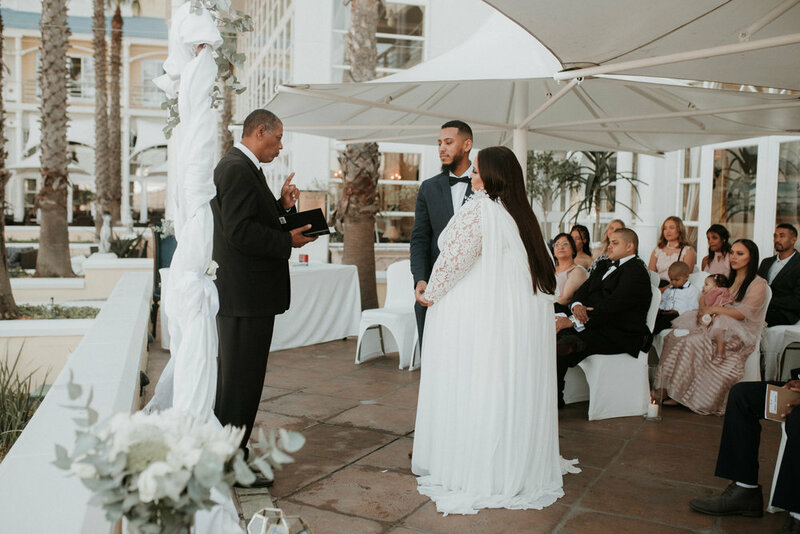 This private couple wanted a small family wedding with only their nearest and dearest in attendance. 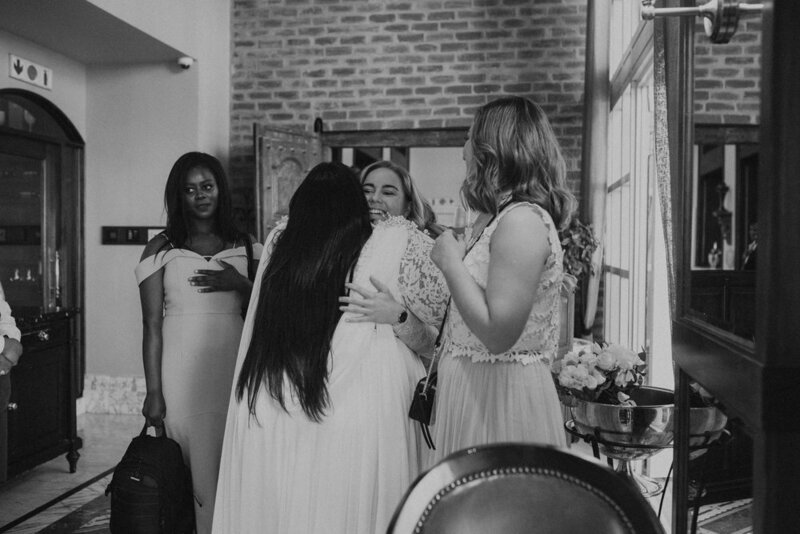 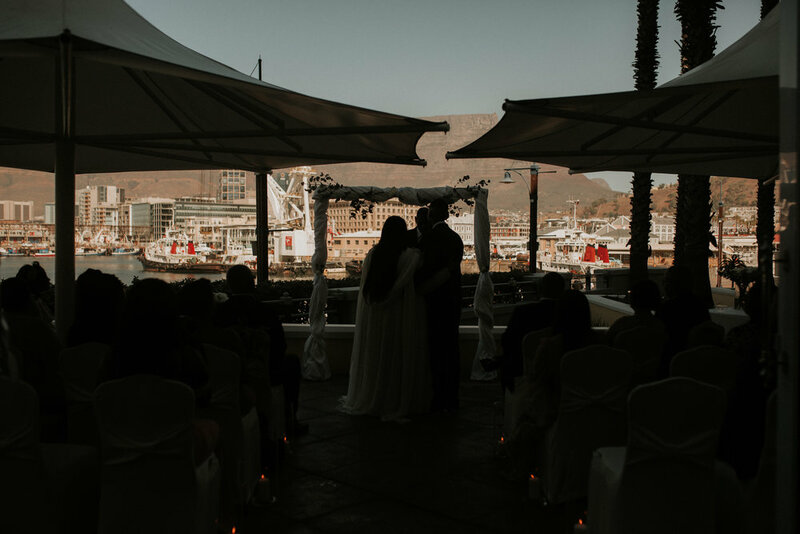 So on April 20th, 2018 they tied the knot in front of 27 of their friends and family at The Table Bay Hotel in Cape Town, South Africa. 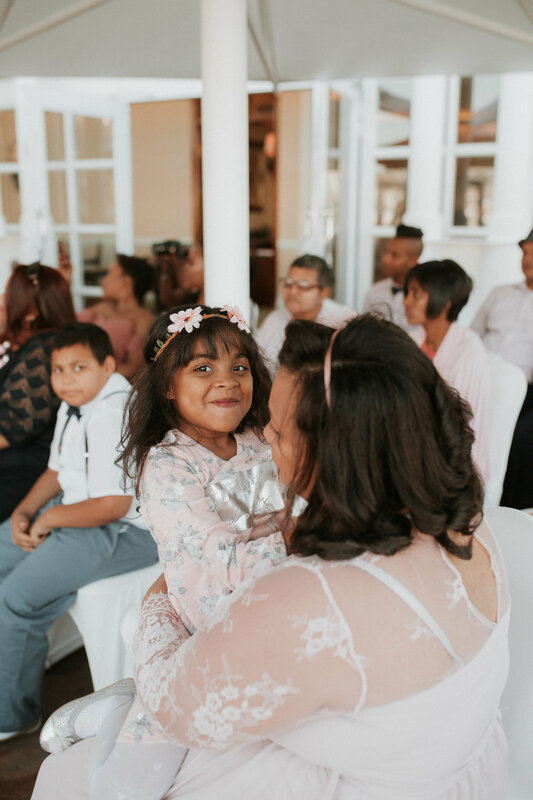 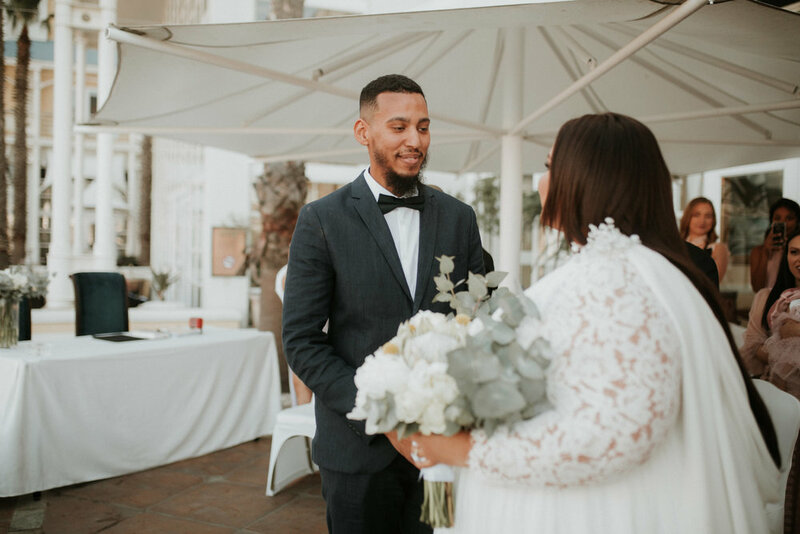 The short ceremony, full of love and big laughs, was outside on the beautiful patio area underneath gorgeous white awnings and overlooking the Atlantic Ocean and Table Mountain. 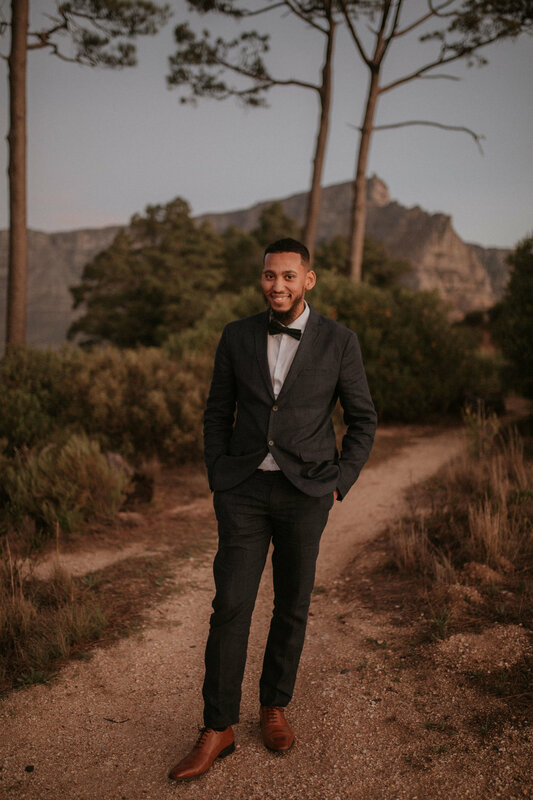 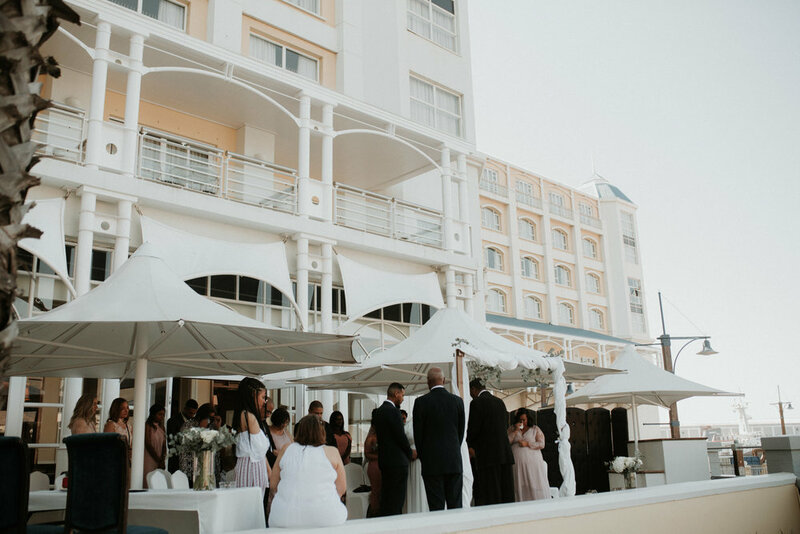 When it came to choosing a venue, Dalreece was drawn to the Table Bay Hotel right away. 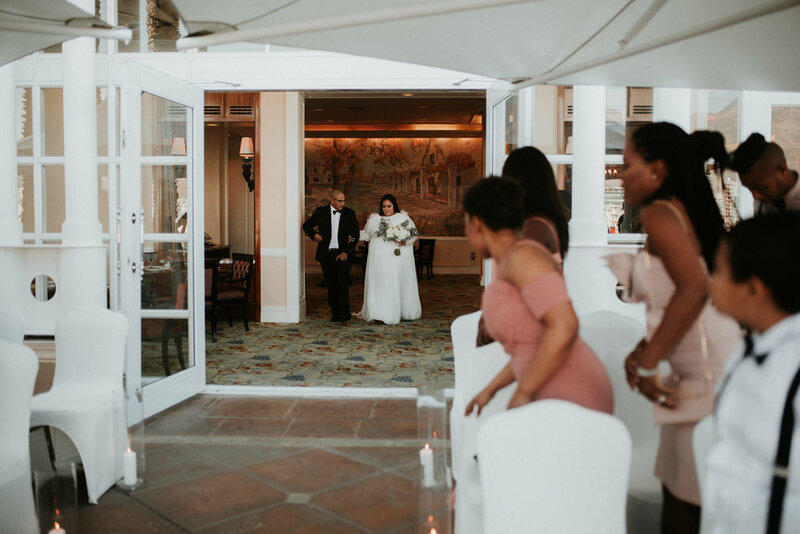 She was familiar with it because she also works as a wedding photographer and she loved the classic elegance. 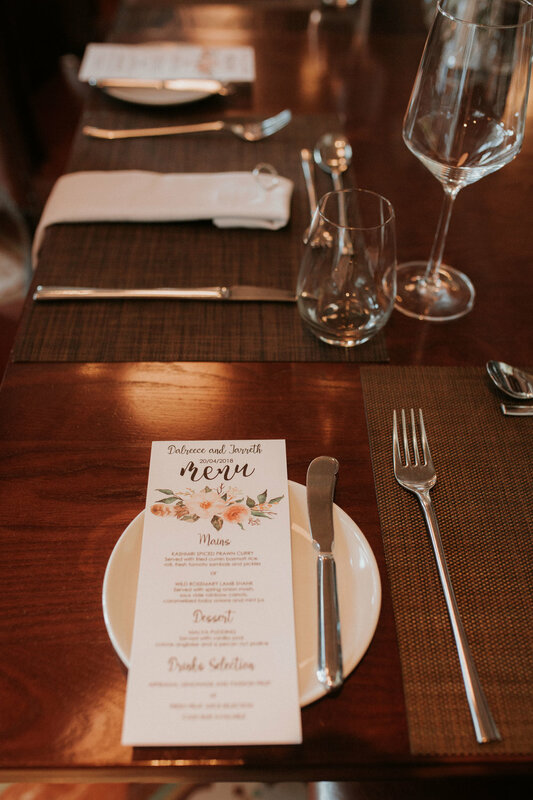 The overall theme of the wedding was simple and timeless. 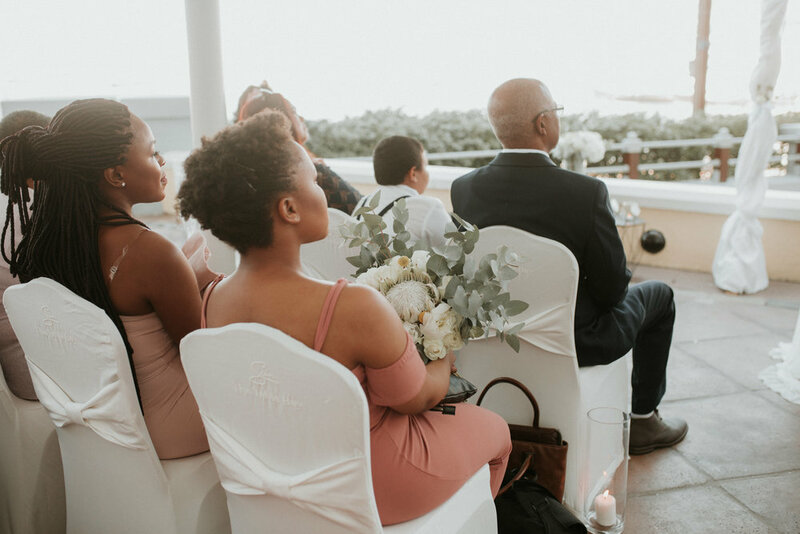 The bridesmaids wore mismatched dresses in shades of blush and the linens, flowers, and decor were all white, making everything look fresh and coordinated. 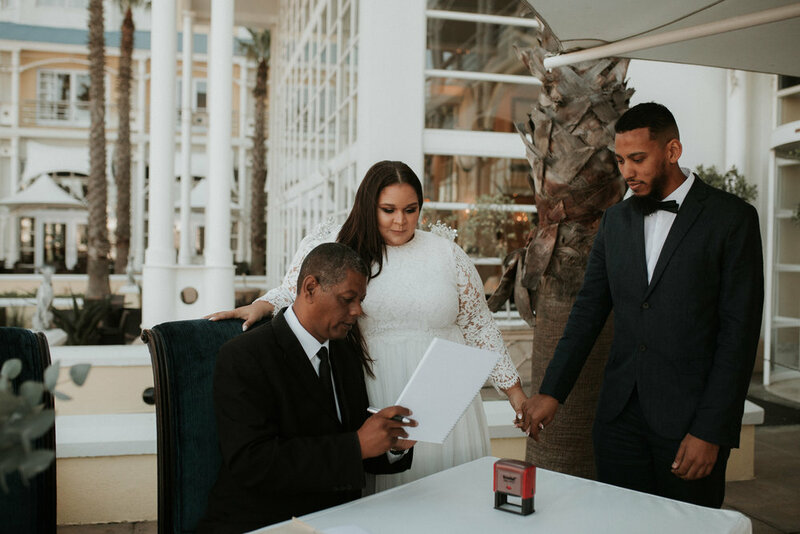 The rings were displayed in a simple lucite box with geometric etching, inside which they lasered their names and wedding date. 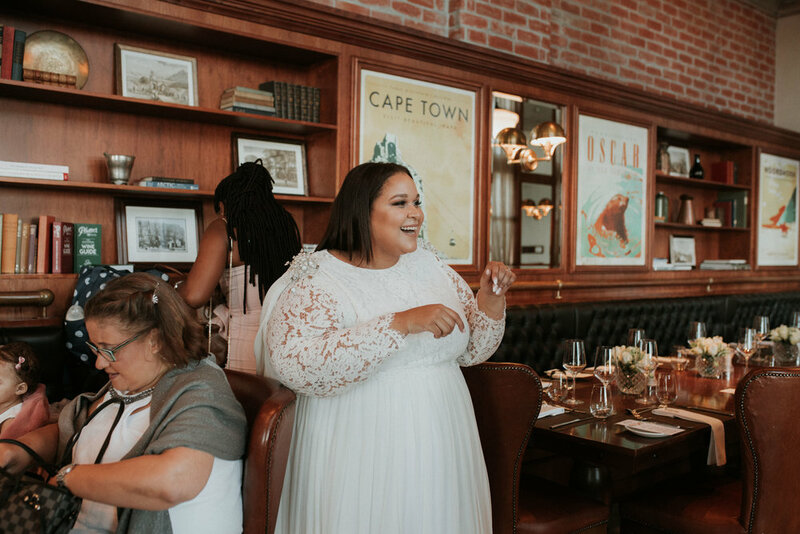 The clean lucite was mimicked on the welcome signage and the cake topper, which sat upon a show-stopping white chocolate petal tower cake made by pastry magician Kanya Hunt. 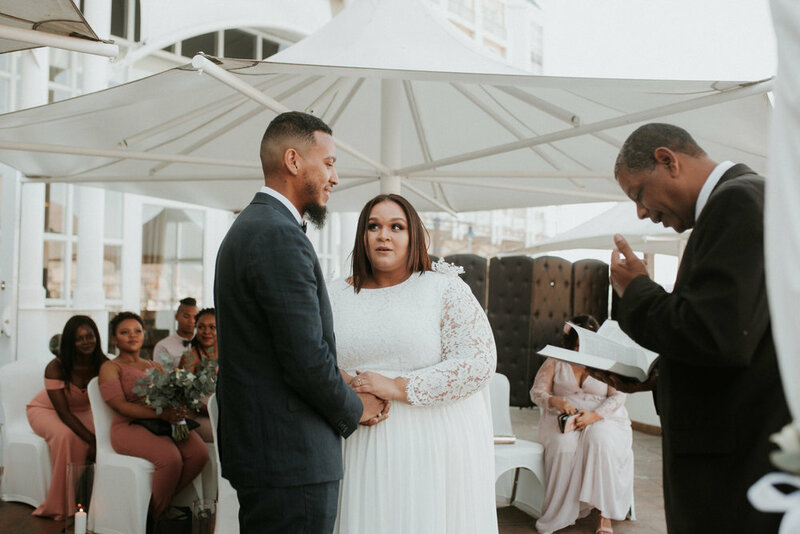 The couple wanted a small family wedding and their budget reflected this at R40000 or $2,800 USD. 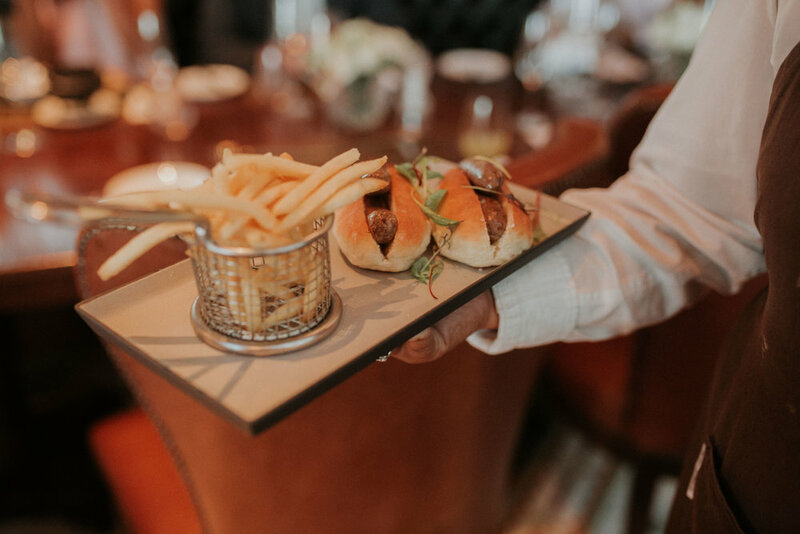 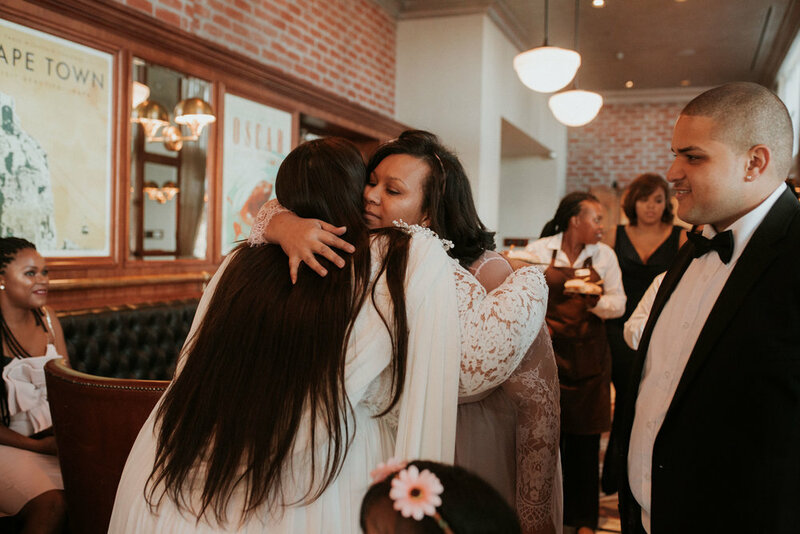 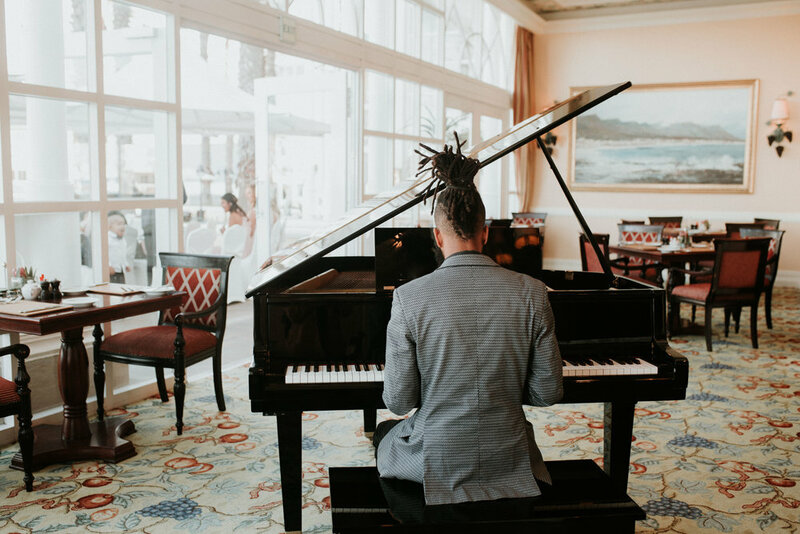 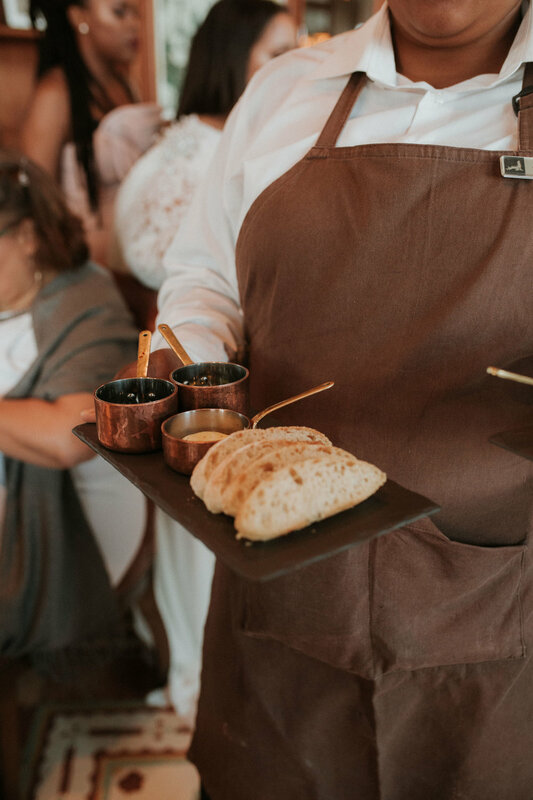 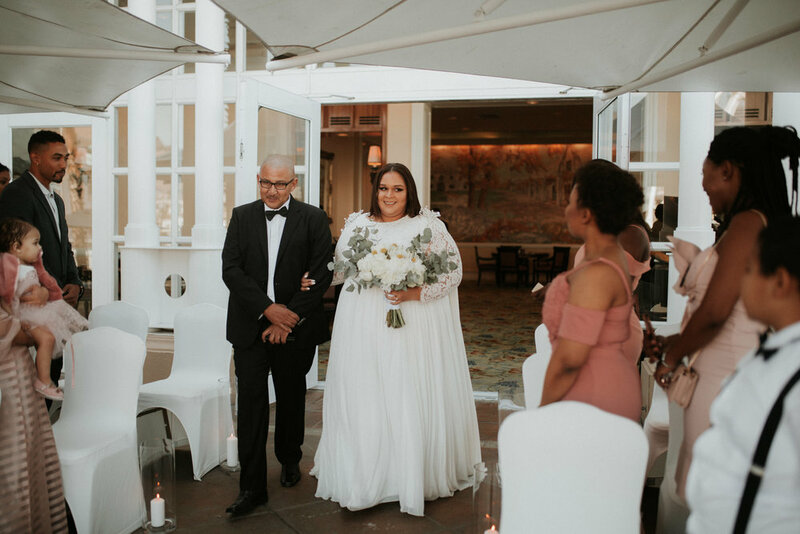 They served a delicious meal at the Table Bay Hotel immediately following the ceremony and their guests loved the good food and the sweetly personal toasts. 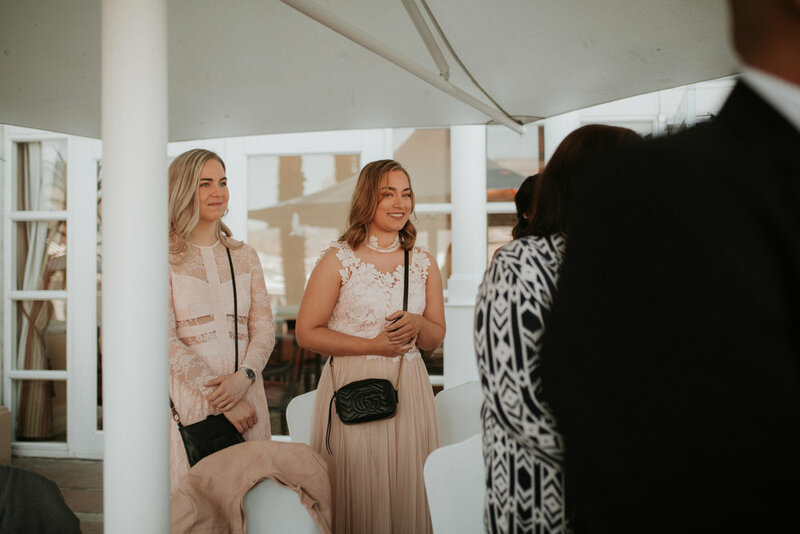 The best part of the day for both the bride and the groom was getting to spend time with their family and friends who travelled to be with them from all over the world. 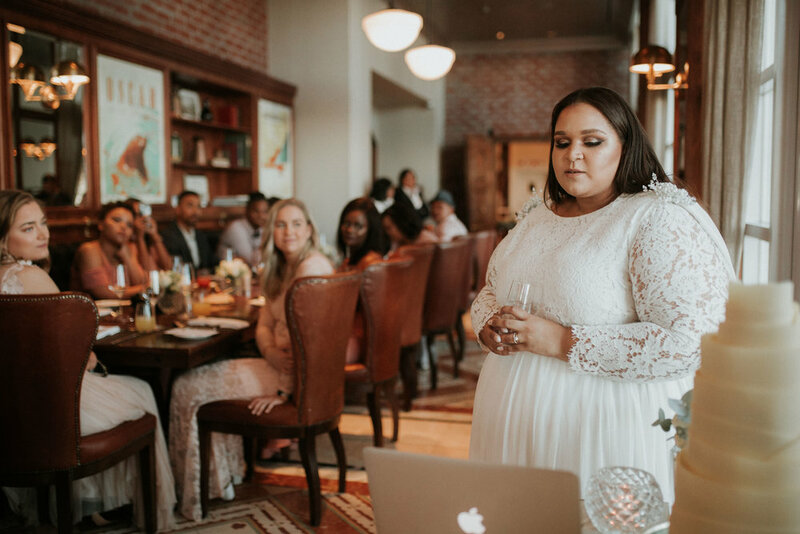 Since they kept their guest list small, they were really able to spend quality time with every person in attendance. 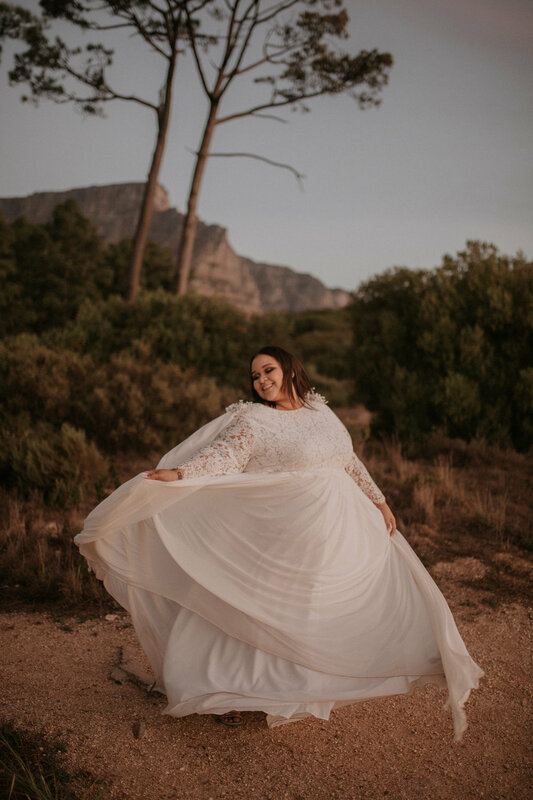 Dalreece wore a stunning bohemian gown with lace sleeves, a flowing white cape in lieu of a veil, and appliqué pearl clusters on the shoulders created by Braemore Design in Port Elizabeth, South Africa. 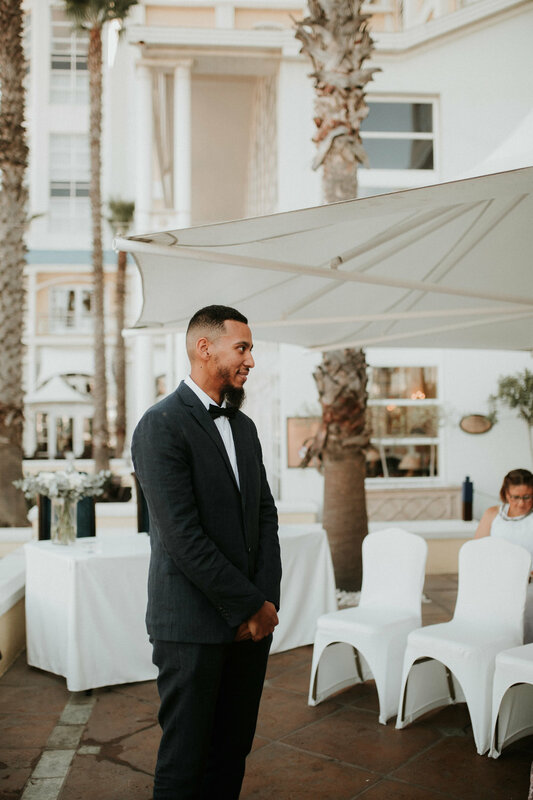 The most challenging part of the day for Dalreece was running around the hotel to get everything set up, but it was well worth it in the end. 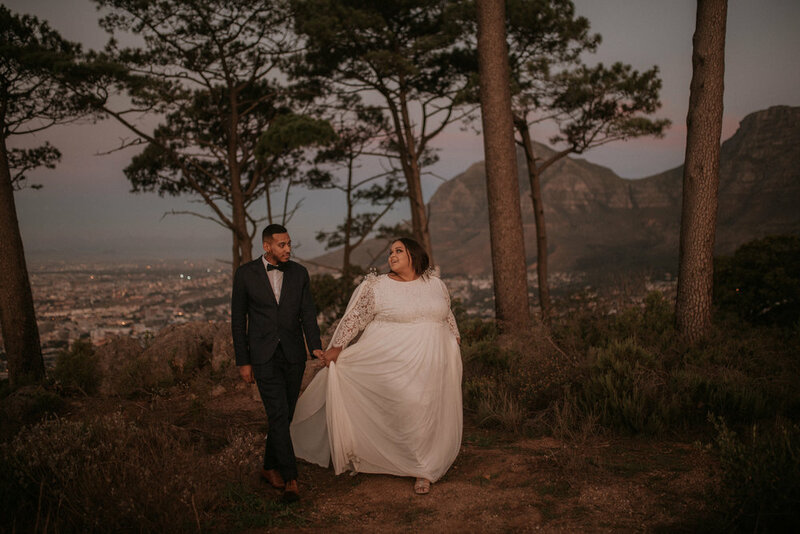 Dalreece’s biggest advice to other members of the Big Bride Club is to plan your own wedding, stick to your vision of the day, and do not let insecurities take away from this beautiful expression of love between you and your partner. 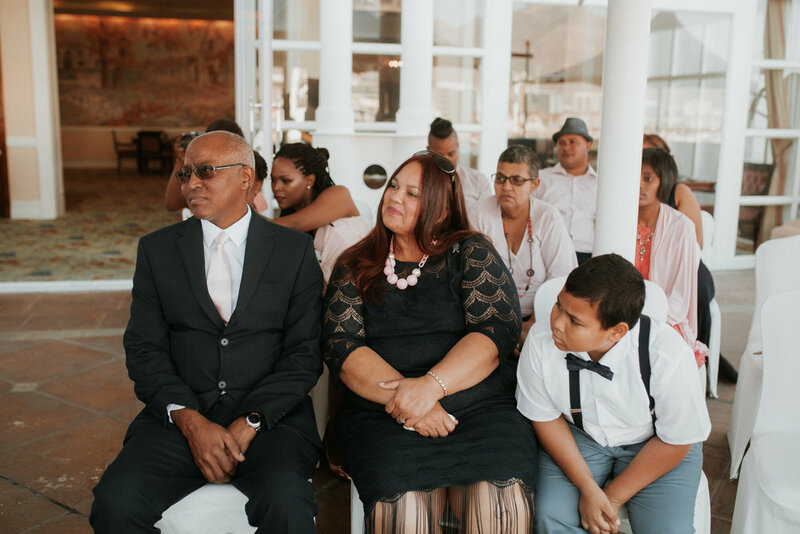 Dalreece draws her strength from Jarreth’s love.